Yesterday, Thomas MacEntee and others, rallied up "the troops" to post comments on an article in PC Magazine written by Jill Duffy in which she reviews the Ancestry.com web site. In Thomas's own words, "The author needs an education as to the reality of genealogy." We need to take a moment and reflect on a few things... first, this is an article for a TECHNOLOGY magazine, and is about the technological ease that Ancestry offers "want to be" genealogists. In the past few years, Ancestry has made tremendous strides to bring genealogy to the mass market. If you think making little leaves (i.e. the hints) appear on a tree is easy, think again. That seemingly simple feature involves huge amounts of hardware and sophisticated software, and yet, it's probably the most effective feature that bridges the gap between novice and "the science of" genealogy. 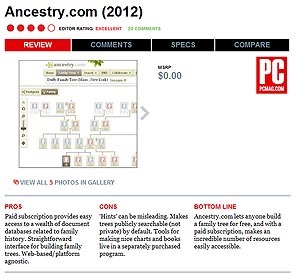 Second, give PC Magazine some credit for even allowing one of its editors to review genealogy products and services. This is a GREAT thing for genealogy as it exposes the hobby to a very different audience. And again, remember this is a review of one service, Ancestry.com, and NOT an article about online genealogy. PC Magazine is about technology, it's not a hobby enthusiast publication. And they're also in the business of selling products, so there's always that hint of "did they get a friendly nudge from Ancestry" to write this review. Third, many of us (i.e. genealogists who've been doing this for years) need to recognize that there is a new breed of "family tree enthusiast." They're a younger crowd, engulfed in technology, used to having information at their fingertips, and (sadly) not so interested in doing the real work (and certainly none of the DIGGING) that genealogy requires. So, for this growing audience, Ancestry has had the insight to adjust their service to reduce (not eliminate) some of the heavy lifting involved in genealogy. Many of you may remember a time (back say prior to 2006) when the main focus of the Ancestry home page was SEARCH, and then one day the search box disappeared, being replaced by a "build-a-tree" feature. All of the sudden, Ancestry changed their focus and market strategy from serving experienced genealogists to catering to "newbies." We can certainly hope that Jill is permitted to review other (non-Ancestry owned) technology-driven services, like MyHeritage and FindMyPast, but we should NOT expect PC Magazine to publish an article highlighting the broad selection of genealogical resources available online.